Mark Webber began his racing career in karts, and became the New South Wales state champion in 1992. He made his Formula Ford debut in 1994, and won the Formula Ford Festival at Brands Hatch just two years later. Mark graduated to F3 with Alan Docking Racing for the 1997 season, and went on to claim five podiums as well as a Brands Hatch victory. He was signed as official Mercedes works junior driver for 1998, and went on to compete in the Le Mans 24 Hours in 1999. Mark's first taste of Formula One came in 1999 when he carried out a two-day test for Arrows at the end of the year. Having signed as the Leafield team's official test driver for the following season, Mark was disappointed when contract problems prevented him from getting back behind the wheel. Despite this, he came third in the F3000 championship driving for Eurobet Arrows, and went on to complete a test for Benetton who were quick to sign him up for 2001. Mark remained in F3000 for 2001, and continued as Benetton test driver, unfortunately he was dropped by the team in favour of Fernando Alonso for 2002, before being signed to race alongside Alex Yoong for Minardi. Mark. Minardi, and probably most of Australia will never forget the afternoon of March 3 2002. Against all the odds the Australian took the under-powered, under-financed Minardi-Asiatech and finished fifth in his maiden GP, narrowly pipped to fourth by Jaguar star Eddie Irvine. So what if Coulthard, Barrichello and Ralf Schumacher had fallen by the wayside, all the Australians cared about was that one of their own had finished fifth in his home GP, and in a bloody Minardi! Following the Melbourne madness it was back to earth with a bump, literally because a few races later both Minardis were withdrawn from the Spanish GP due to front wing failure. Lack of money meant virtually no testing, other than promotional outings in the Minardi two-seaters, while Asiatech, which was having problems of its own, made little progress with the V10. Late in the summer however came the news that Niki Lauda had signed Mark, along with Brazilian hot-shot Antonio Pizzonia to spearhead Jaguar's challenge in 2003. Sadly Mark was unable to repeat his 2002 feat when he returned to Australia in 2003, however right from the outset it was clear that Webber was going to be one to watch. Poor reliability meant that Mark didn't score his first points until Spain, though by that time his pace was clear and had indeed led to Jaguar making its dissatisfaction with team-mate Antonio Pizzonia public, the Brazilian having been regularly out-performed by the Australian. Seven points finishes meant that Mark finished tenth in the Drivers' Championship, and contributed all but one of the points that led to his team finishing seventh in the Constructors' Championship, one of its best results to date. In early-summer Jaguar announced it had signed a new deal with Mark keeping the Australian until the end of 2005, however it was clear that several other teams already have their eye on him. When Montoya was linked with a short-notice move to McLaren for 2004, there was widespread conjecture that Webber would be the obvious replacement at WilliamsF1, such was the regard in which the Aussie was held. The most striking thing about Webber in 2003 was his pace and consistency, it was merely the shortcomings of the Jaguar package that prevented him achieving more. Sadly the 2004 car was little better, but from quite early on in the season it was clear that Mark wouldn't have to suffer the frustration for much longer, since he was being linked with a move to WilliamsF1. In mid-July one of the pitlane's worst kept secrets was out, when the Australian signed a deal with the Grove outfit for "2005 and beyond". Despite the inherent problems at Jaguar, Mark continued to give 100% and did his best to build the team, taking his cue from the driver he most admires in F1, Michael Schumacher. In spite of the car's limitations, there were some great moments, most notably qualifying second in Malaysia and third in Japan. Seven world championship points doesn't go anywhere near telling the true story, for Webber continually impressed, however as the season progressed the Cosworth became less and less competitive. Once Ford announced that it was pulling out of F1, and the future of Jaguar, and its workforce, hung in the balance, Mark actually moved up a gear, and became a source of inspiration for all those around him. Only Mark will really know, ignoring the performance of the FW27, whether 2005 lived up to expectations. Being his first season in a (relatively) front-line team, all eyes were on the Australian, just as they were on his teammate, Nick Heidfeld, who was also experiencing his first season with a potential race winner. With the BMW/WilliamsF1 marriage reaching the end of the road, and the German manufacturer, once it had made the decision to jump ship, clearly failing to maintain development, the season was never going to be easy. However, as far as Webber was concerned, the Australian hadn't made things easy for himself. As ever, his qualifying performances were superb, being one of the few drivers to really revel in the 'hot lap' format. Unfortunately, his outstanding qualifying performances were rarely converted into decent race finishes. For Webber, the 2005 season could be summed up in one word, 'frustration'. Be it problems with the car or problems with his own performance, the frustration was always evident, and often resulted in the Australian over-driving. In Heidfeld - possibly for the first time - he was under pressure from a teammate determined to prove himself, and this too added to the Australian's frustration. The drive in Monaco was superb, but even then Mark's performance was over-shadowed by that of his German teammate. Then there was the Nurburgring, where, in spite of a heavy fuel load, Webber qualified third… only to throw it all away at the first corner. Whether it was as a result of the frustration or not, we don't know, however, during 2005 we heard talk, from reliable sources within the team, that the Australian's attitude towards him had deteriorated, with some team members losing patience and referring to him as a Prima Donna. How different from the Jaguar days. In 2006, Webber was retained by WilliamsF1, which, following the 'divorce' from BMW, had a one-year deal with Cosworth, pending a rumoured partnership with Toyota in 2007. Much was expected of the package, especially with Alexander Wurz - a shock defection from McLaren - joining the Grove outfit as test driver. However, if Mark thought 2005 was frustrating he was in for further misery in 2006. If there was one thing one could guarantee regarding the FW28-Cosworth package it was the undoubted reliability of the engine. However, even this had its moments during a season in which the Grove team suffered the worst reliability of all eleven teams, one of the worst seasons in its long, illustrious history. Engine, hydraulics, exhaust, transmission, electrics, water leak, driveshaft, tyres… you name it, it went wrong. Even when Mark seemed certain of third place in Monaco, an exhaust collector cracked causing hot gas to damage his electrics. While in Turkey, where both cars were running on heavy fuel, and running fourth and sixth, a safety car period robbed Mark and his teammate of any advantage. Lack of pace, poor reliability, the switch to Bridgestones and sheer bad luck - the two Williams colliding on the first lap of the season opener was a portent of things to come - all conspired to make it a season to forget for the Australian. There were some typically heroic qualifying performances from Mark, but sadly he was rarely in a position to convert these into results. Seven retirements, including hydraulics, transmission, engine and tyre troubles sum up the Australian's season, a genuine Annus Horribilis. 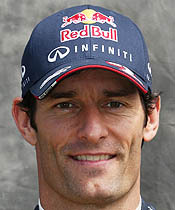 In August clearly despairing as to how things were going, Webber announced that he was joining David Coulthard at Red Bull for the following year, thereby giving the 'youth focussed' team one of the oldest line-ups on the 2007 grid. Mark saw out the season with Williams, making the best of a bad situation, eagerly looking forward to the new season and (hopefully) a new beginning, with an Adrian Newey chassis, married to a World Championship winning Renault engine... surely things could only get better. They didn't. For in much the same way that Mark's 2006 season was blighted by poor reliability, so too was 2007, albeit with a different team. Following a string of retirements, two down to the Red Bull's transmission and one to 'hydraulics', Mark had to wait until the seventh race of the season before he picked up his first points of the year. There was a podium finish in Germany, but even Mark would be the first to admit that this one of those strange results thrown up by freaky conditions. From seventeen starts, Mark suffered six failures and one accident - that being the controversial incident involving Sebastian Vettel, but which was subsequently found to be Lewis Hamilton's fault. The hapless Australian must surely have wondered what he'd done to deserve such bad luck, especially as Williams appeared to have sorted (most of) their problems. Nonetheless, despite the trials and tribulations, the Aussie gave a good account of himself, particularly in qualifying. All too often he made it through to the final phase only to see his hard work come to nought when his car failed in the race. Despite speculation that he, or teammate David Coulthard, might be dropped should Dietrich Mateschitz persuade Fernando Alonso to join the Milton Keynes outfit, Mark was retained for 2008, his seventh season in F1. His season got off to a difficult start in Melbourne when, despite being in the top six in all three practice sessions, a brake disk failure meant he qualified fifteenth. Next day his race came to an early end when he was hit by Anthony Davidson who was locked in battle with Kazuki Nakajima. Despite the misery of Melbourne, Mark bounced back… and how! In the next seven races he scored points in six, only once failing to make it through to the final phase of qualifying. Silverstone could and should have been his crowning achievement. Having qualified second however, the Australian threw it all away when he span on the Hangar Straight on the opening lap - his on-board camera capturing the error for all the world to see. That said, the one positive to come out of the British GP weekend was that Mark agreed an extension to his contract with Red Bull, keeping him with the Austrian outfit until the end of 2009. In the latter stages of the season as his team lost ground to Toyota, Renault and ultimately Toro Rosso. Mark struggled, though he rarely gave less than 100 percent. The point in Belgium was the result of the penalty handed to Timo Glock, while the further point in Italy will have been little consolation as the Australian watched Sebastian Vettel take pole and victory in a similar car. Clever strategy saw Mark running second in Singapore, however, the Australian was to suffer the team's first mechanical (race) failure of the season which put him out after 29 laps. There was a typically dogged performance in Japan where a first corner incident left him dead-last. The Australian subsequently worked his way through the field and in the closing stages battled manfully to hold off Felipe Massa, despite the fact that the tyres on his Red Bull were shot. Finishing ninth on the road, the Aussie's efforts were ultimately rewarded with a point courtesy of the (unfair) penalty handed to Sebastien Bourdais. In China Mark was hampered by a ten-place grid penalty after his engine failed in free practice, and despite a strong race, poor strategy meant he was unable to add to his points tally. At season end, Mark had scored 21 points, finishing 11th in the Drivers' Championship, his best finish season since 2005. It didn't paint half the picture in terms of his dogged performances and woefully bad luck. In 2009, Mark was joined at Red Bull by one of the sport's true rising stars, Sebastian Vettel. The Australian had always given a good account of himself in terms of taking the fight to his teammate, but in Vettel it was widely said that he would have a real fight on his hands. In 2007, following the incident involving Vettel which put an end to his Japanese GP, Mark said: "Well it's kids, isn't it. Kids with not enough experience, doing a good job then they f**k it all up." We all waited to see how much the kid had grown up in 2008 and how Mark would handle him. While 2009 did indeed see Vettel come of age, so too did Mark with a number of supreme performances. The Australian limped on to the Melbourne grid wearing a steel splint in one leg, the souvenir of an accident during his annual charity cycling event in Tasmania during the off-season. However, it wasn't the steel splint that left him finishing the season opener in thirteenth place, a lap down on the leader, but a mistake in qualifying which left him eighth on the grid and an incident involving Barrichello, Kovalainen and Heidfeld at the start. The fact that Brawn hadn't tested in the wet played into Red Bull's hands in China and Mark was there as Vettel led the team to its first win, indeed, its first 1-2. In the weeks that followed, as the Milton Keynes outfit worked tirelessly to introduce its own double diffuser and get it working properly, Mark gave a number of excellent performances constantly adding to his tally. Another 1-2 at Silverstone was followed by the Aussie's first win and arguably his best ever performance. Having taken pole for the German GP, he was subsequently given a drive through following a minor incident involving Barrichello at the start. In one of those epic 'red mist' performances the Australian served his (unfair) penalty and fought his way back to the front, taking his first ever F1 win and giving his team its third 1-2 of the season. As the RB5 got better and better and the Brawn struggled, Mark was actually in with a shout of winning the title, moving into second place in the championship in Hungary. However, an accident on the first lap at Monza and a brake problem in the subsequent race in Singapore all but ended his chances. Following a superb win in Brazil, Mark rounded off the season with another supreme performance in Abu Dhabi holding off an eager Jenson Button, the Englishman having secured the title at the previous race. While 2009 was a major step forward for his team, so too it was for Mark, the 33-year-old not only showing pace and determination but a new maturity. The arrival of Vettel definitely appeared to bring out the best in him however, as the German grew in confidence all eyes were on the Australian to see how he handled things in this second season together. A difficult weekend in Bahrain, where Webber was forced to "follow gearboxes all afternoon", was followed by an equally frustrating home race where the Red Bull driver - looking set for sixth - clouted Hamilton in the final stages, dropping the Red Bull driver to ninth. Having taken a mighty impressive pole in Malaysia it was widely expected that Mark would open his win account next day. However, the combination of his own poor start and a rocket-like get away from teammate Vettel left the Australian playing second fiddle. China was a disappointment for Red Bull, both drivers admitting they were "blown away" by and "not quick enough" for the McLarens. However, in Spain and again in Monaco - one of the sport's Blue Riband events, it all went perfectly for Mark, the popular Aussie taking a brace of back-to-back wins that left he and his teammate joint championship leaders. With its two drivers on 78 points, Red Bull, its car continually improving now the European season was underway, went to Turkey feeling confident. And why wouldn't they? Come the race, the duo were looking set for their third 1-2 of the season when, suddenly, on lap 40, it all went pear-shaped. Vettel, feeling he was the quicker driver at that stage, made a move on his teammate. The gap wasn't there, besides which they were approaching a left-hander, they clashed. "If you watch it on the TV, you can see what happened. I'm not in the happiest of moods," said the German. "I was on the inside going into the corner. I was there, I was ahead and focusing on the braking point and then we touched. I think I was a bit quicker than Mark for two or three laps, I was catching him and thought I could get him on the back straight. I was very close and passed him on the left, that's the story." Needless to say, Mark saw it slightly differently. "Sebastian had a bit of a top speed advantage, he went down the inside and we were side by side," said the Australian. "I was surprised when he came right suddenly, as I was holding my racing line. It happened very, very fast and it's a shame for the team. Not an ideal day. "Neither of us wanted to make contact with each other. It's obviously not ideal, but it happened. There was a long way to still go in the race, but that was an interesting few metres on the track between both of us. In the end it wasn't the result that either of us wanted. We've got great character in our team and two fast drivers at the front - we're not dicing for 15th and 16th - we're going for victories so there's clearly a lot at stake. I'll have a chat with Sebastian about it, we might have a difference of opinion but we'll be adults about it and press on." Although the media was having a field day, doing its best to stir up the situation, it was clear that things were getting to Mark. In Canada he finished a disappointing fifth while in Valencia he made it back into the headlines for all the wrong reasons. Following his pit stop the Australian got far too close to back-marker Heikki Kovalainen. The two touched wheels sending the Australian's RB6 into a sickening back flip before crashing upside down onto the tarmac and sliding into the barriers. It was one of those crashes that makes us all wonder how and why these guys get into these cars in the first place, never mind continuing after such an incident. Nonetheless, totally unscathed, at least on the outside, Webber was back on form at Silverstone, taking a superb win that placed him a firm second (to Hamilton) in the title fight. We say unscathed on the outside because inside Mark was clearly hurting. Other than what happened in Turkey, the press was still making much of the revelation that Vettel, having complained of a problem with one of his chassis, was given one of Mark's. To compound matters, ahead of qualifying for the British GP, having damaged his own new front wing, the German was given the Australian's. Therefore, who didn't allow themselves a smile when, on taking the chequered flag, Mark snapped down the team radio: "Not bad for a number two, eh?" much to Christian Horner's obvious embarrassment. Strong finishes in Singapore and Japan meant Mark went into the final three races still leading the championship, fourteen points clear of his rivals. Although he remained a favourite for the title right up to the season finale in Abu Dhabi, for many, Mark's season ended on the 18th lap in Korea. In hot pursuit of his teammate, the Australian ran wide and lost control on the wet kerb at Turn 12. To consolidate a miserable day the Red Bull driver, his car still slithering to a halt after hitting the barriers, collected Nico Rosberg, thereby also ending the German's hopes of a good points finish. While much of the media speculated about the use of team orders at Red Bull, former F1 star Gerhard Berger accused Mark of deliberately taking out Rosberg in Korea, a mean spirited and totally needless comment. Nonetheless, in terms of team orders, with Vettel being a product of the Red Bull programme - even if he earned his stripes in Formula BMW - many believed that when push came to shove the Austrian outfit would favour its German protege. Not so, said Dietrich Mateschitz. Not so, echoed Christian Horner. In the end however, there was no need for team orders. Despite a strong performance in Brazil which gave the team the Constructors' Championship at the sixth attempt, Mark was unable to match back-to-back virtuoso performances from his teammate in Brazil and Abu Dhabi which not only ended the Aussie's hopes but also defied the odds, snatching the crown from Fernando Alonso's grasp with contemptuous ease. In December 2010, writing in his book 'Up Front - 2010, A Season To Remember', Mark claimed that he contested the last four rounds of the season with a small fracture to his right shoulder, the result of a mountain bike accident while riding in Melbourne the week before the Japanese Grand Prix. It was the first his team had heard of the injury. Despite speculation over the winter that Mark, frustrated by the events of 2010, might move on, he remained with the team, though our sources insist that at the pre-season tests the mood in the camp was bleak, to put it mildly. The Australian kept his head down however, and got on with the job, though there was little that he could do about the Vettel steamroller. Mark took pole at Silverstone, beating Vettel by 0.032 seconds. However, the race did not go so well, another poor start, combined with a poor pit stop saw the Australian running behind Alonso in fourth. A late charge however, saw Mark pass the Spaniard and begin to close on his Red Bull teammate, at which point the order was given to "maintain the gap", a call the feisty Aussie totally ignored. While he did indeed close in on Vettel, the German was able to hold him off, leaving the Australian to finish third. Ironically - or not - one of Mark's best performances of the year came in Germany where he qualified ahead of his teammate and brought the Red Bull home in third, behind Hamilton and Alonso. After a difficult race in Hungary, things went much better in Belgium where Mark was on fine form. Finishing second, his team's second 1-2 of the season, the race will long be remembered for the Australian's bold move on Alonso at Raidillon, a real heart in the mouth moment. A collision with Felipe Massa at Monza saw Mark's only retirement on the season, though top four finishes in the next five races went some way to making up for this. In Brazil, the season finale, while Vettel broke Nigel Mansell's record, taking his fifteenth pole position of the season, it was Mark who was to take victory in the race next day, the Australian scoring his first win since Hungary 2010. Early in the race, the German, who had wrapped up the championship in Singapore, encountered a gearbox problem and subsequently moved aside to allow his teammate through. As sceptics were to note, the gearbox issue didn't prevent Vettel finishing second, just 16s down on Mark, thereby taking Red Bull's third 1-2 of the year. Retained for 2012, Mark went into the new season knowing that it was now or never. Like its rivals, Red Bull spent the first part of the season attempting to get to grips with the new Pirelli rubber however, matters were further complicated by the fact it no longer had the advantage of the blown diffuser. Despite that, the team scored three wins in the first half of the season, ironically, two of them coming from Mark who had never quite got to grips with the advantage offered by the blown-diffuser the previous year. At mid-season, second in the championship, and ten points clear of his teammate, things were looking good for Mark. Indeed, to the surprise of many, the Australian was handed a new one-year contract. However, after the summer break the team took a clear step forward and, as in 2011, it was Vettel who was able to make the most of it. While Mark will rightly blame "nutcase" Romain Grosjean for Japan, the numerous poor starts, particularly in Korea, were down to the Australian. Having been a serious title contender at mid-season, by the end of the year, having scored only two further podium finishes, the Australian had slipped to sixth in the standings. Ahead of the 2013 season, Mark knows that he is reaching the end of his career. While it is highly unlikely he will be retained by Red Bull for 2014 he might yet squeeze in another season or two with one of the smaller outfits. While he's had a good innings, the fact is that for three years he had a championship winning car at his disposal, and while there might be a certain amount of bias within the team, certainly from Marko and friends, the fact is that, for the most part, Mark has not kept his teammate as honest as he might have.